Stanley Kubrick's Oscar-nominated black comedy starring Peter Sellers and Sterling Hayden. When lunatic General Jack D. Ripper (Hayden) launches a nuclear attack on Russia, President Merkin Muffley of the United States (Sellers) consults his advisors, among them the wheelchair-bound, ex-Nazi scientist Dr Strangelove (also Sellers). George C. Scott, Keenan Wynn, James Earl Jones and Slim Pickens all co-star. Interviews: Peter Sellers and George C. Scott (featurette). 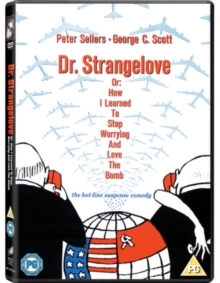 Other Documentary: 'Inside the Making of Strangelove'. 'The Art of Stanley Kubrick'.